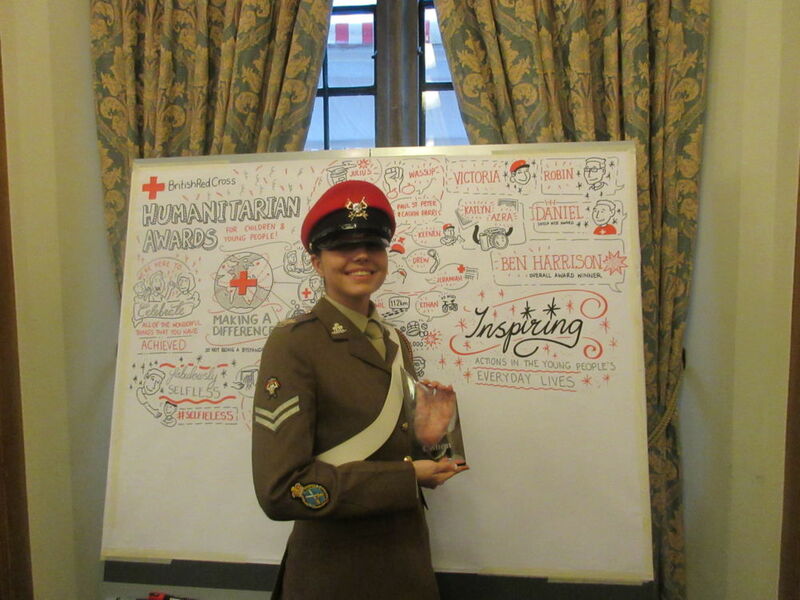 Congratulations to Cadet Sergeant Major Jeremiah Emmanuel (South East London) who has won the First Aid Award and to Corporal Victoria Richbell-Davies (Beds and Herts) who won the Judges' Special Award at the 12th annual British Red Cross Humanitarian Awards. The ACF has now won the First Aid Award for three successive years. The Awards celebrate young people (aged 25 and under) who have triumphed over personal challenges, enriched their communities and been first aid heroes. Many of the Awards winners have also been involved in volunteering and raising money and awareness for good causes. Jeremiah treated a casualty moments after the man was repeatedly stabbed five times in the head, chest, back and leg. Using t-shirts, belts and hoodies to stop the bleeding, Jeremiah stayed calm throughout and was able to keep the casualty alert and awake. When the police arrived, they encouraged Jeremiah to continue with first aid until the ambulance came and took over. Later he heard from the casualty that he was making a good recovery. Jeremiah has a strong track record in volunteering and community work including founding the campaign group ‘One Big Community’ at the social justice charity Cambridge House to help engage with decision makers. Victoria has given long-term medical assistance to her mother since the age of six, sharing the role of carer with her father. In addition, while helping at an ABF The Soldiers’ Charity event, she was called on to help two casualties, one of whom required an ambulance to be called. Keenan put his first aid skills to good use when a man, with head injuries and a hand that had been almost severed at the wrist, turned up at his house. Keenan, who was 15 at the time, used a top, quilt and blanket to help stem the man’s bleeding even though he knew that the attackers were still in the area and watching the proceedings. When Drew saw a friend stabbed in the park he took quick and effective action. Drew made sure pressure was placed on the chest wounds, took control of a heavily bleeding leg wound, applied pressure to the wound, directed others to stay back, got others to call ambulance, used a tie to apply a tourniquet and kept reassuring both bystanders and the victim until an ambulance and the police arrived. Zack was travelling to Scunthorpe Civic Centre to meet the Mayor about the ‘Clean for the Queen’ campaign when he came across a fellow cadet suffering from a seizure and choking. He jumped out of the car, driven by his mother, to manage the situation until he was able to give a handover to the emergency services. Ewan took charge when a man, with serious head injuries and whose hand was almost severed at the wrist turned up at his house. Ewan used a top, quilt and blanket to help stem the bleeding even though he was aware the attackers were still in the area and watching the proceedings. 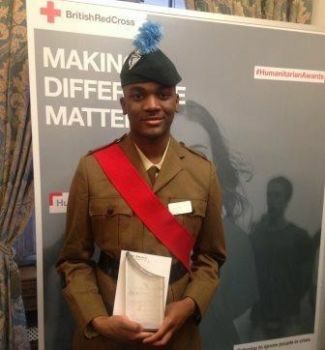 Summing up the event, Mike Adamson, chief executive of the British Red Cross, said: “These young people are an inspiration to everyone. “They are committed to making a difference and helping people in their communities – they embody true humanitarian qualities.